The consultation period will run until 30 November. In early 2010 a second version of the strategy will be published for formal public consultation. “The Mayor’s acknowledgment of the seriousness of London’s air quality problem and that it has not improved in recent years is welcome. In fact, the level of dangerous airborne particles (so called PM10) in London has increased at a mean rate of around 0.4% per year since the late 1990s Note 1. “The scale of the nitrogen dioxide (NO2) challenge dwarfs that for PM10. Even the government’s own forecasts indicate 1,117 kilometres of roads in London will breach legal standards in 2010 with 520 kilometres still in breach in 2015 (the final date for compliance if a time extension is obtained for NO2) Note 2. The Mayor estimates some 700,000 Londoners live in areas expected to breach legal standards for NO2 in 2010. 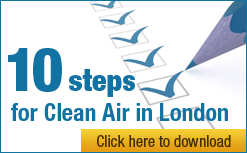 “Some encouraging new measures are included in the Mayor’s draft Air Quality Strategy (AQS). For example, plans to start cleaning up the bus and taxi fleets and launch a public information campaign. delaying or cancelling the two biggest measures already in train i.e. Phase 3 of the London low emission zone (LEZ) and the western extension Note 6 of the congestion charging zone (WEZ). there is still no credible plan for London to comply with legal standards for PM10 by the June 2011 deadline since most measures (even if funded) would not be implemented until 2012. Ad hoc and minor measures and ‘pre-compliance’ (i.e. the early purchase of LEZ compliant vehicles for Phase 3, in contrast to the experience of earlier Phases) would be relied upon as London ‘seeks to meet’ these legal standards in 2011. “The first of these is sure also to torpedo the government’s application to the European Commission for a time extension until June 2011 to comply with legal standards for PM10 (since you cannot substitute uncertain measures for certain ones) Note 8.
what will the government do to fix the shambles it has created nationally on NO2? See Figure 2.3 on page 15 and paragraph 46 on page 18 for forecasts of concentrations of NO2 in London in 2015 and the identification of Oxford Street. Nitrogen dioxide (NO2) – Figure 5.4 on page 78 of the AQS indicates that NOx emissions from all sources in Greater London (including planned measures, natural vehicle fleet turnover etc) are expected to fall by 35 to 40% from 2006 to 2015. The Mayor’s media release seems to imply this reduction will reduce concentrations of NO2 by a similar (or the same) amount. History suggests otherwise. Defra’s draft report of February 2009 titled ‘UK Approach to its Application for Time Extension Notification to Nitrogen Dioxide Limit Value Deadline’ identifies Oxford Street as having average annual concentrations of NO2 of nearly 100 micrograms per cubic metre (μg/m3) in 2015 (assuming previously planned measures) Note 2. It seems unlikely therefore that a 40% reduction in NOx or NO2 would result even in the limit value plus margin of tolerance being met in Oxford Street (i.e. 60 μg/m3) (which is a requirement from January 2010 if a time extension for NO2 is obtained by the United Kingdom). European Union limit values for ambient air quality must be met everywhere (with some exceptions). It is not satisfactory therefore just to try to comply with the limit values in most places. In part this requirement ensures that limit values are more than met elsewhere, with commensurate health benefits. The draft AQS suggests that this huge problem can be dismissed as just ‘a few hotspots’ (page 40) and tackled (page 39) by: planting street vegetation; local traffic management; and the focusing of cleaner buses down the most polluted routes, where possible. It hopes also that pre-compliance (i.e. the earlier meeting of standards for Phase 3 of the Low Emission Zone would help (when earlier Phases showed late compliance, not early).